Countering the narrative of mainstream media and the current divide over Donald Trump’s desire to build a border wall, Rand Paul weighted in to point out just how much theater is involved in this circus sideshow we call government. During an interview with WBKO on Sunday, Paul discussed the issue of the wall with reporters and urged the left and the right to reach a compromise as not to shut down the government again. Paul didn’t say whether or not he was for the wall, he did, however, urge Republicans and Democrats to come together and get over this issue. 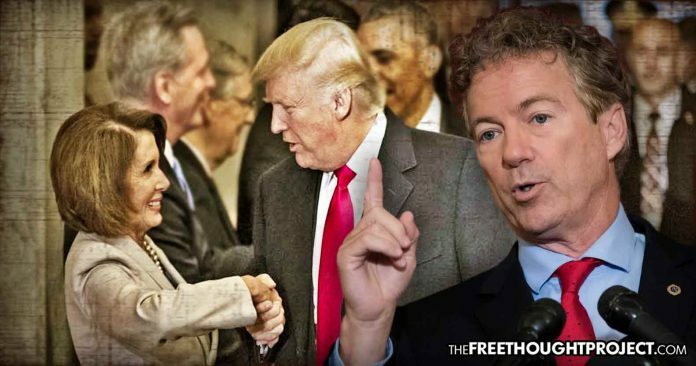 Paul then went on to expose the ridiculous political theater of the democrats calling Trump’s wall ‘immoral’ as they have once voted for the same thing. “We’ve heard Nancy Peolsi say, ‘oh the wall is immoral.’ Well, most of these democrats have voted for this wall before, so it didn’t used to be immoral,” Sen. Paul said. Technically, it wasn’t a wall, but a fence. But outside of semantics, what Paul said is entirely true. In 2006, Democrats lined up to pass legislation building a physical barrier along the US border with Mexico. Funny how it wasn’t so “immoral” back then. Then-senators Obama, Clinton, Schumer and 23 other Democrats voted in favor of the act when it passed in the Senate by a vote of 80 to 19. The Secure Fence Act of 2006 was signed into law by George W. Bush on October 26, 2006. It received bipartisan support. Other than saying ‘fence’ instead of ‘wall’, this sounds just like Trump’s ‘border security’ plan. The reality is that these folks couldn’t care less about your security or the treatment of immigrants and refugees at the border. No matter which party has the power, the police state grows, innocent people suffer, and the US gains more enemies because of our foreign policy. If either party were truly concerned with policies that would keep Americans safe, they’d stop creating these refugees en masse by meddling in other countries. As I pointed out last week, this change in foreign policy alone would be magnitudes more effective than a wall and it would save American billions. If you think that these people are fleeing their countries, leaving behind their families and homes, just to come to the US to get “free stuff,” think again. Starting under Ronald Reagan, the US has been funding extremist military regimes who’ve carried out mass murder, kidnappings and tortures in El Salvador, Guatemala, and Nicaragua. US-backed military coups, exploitation of resources, and America’s history of spreading economic neoliberalism in El Salvador have sent the entire region into chaos—just like what happens in all the countries who’ve been unfortunate enough to receive some “freedom” from the US. What’s more, it’s effectively created a climate where paramilitary-aligned drug cartels can and do thrive. These same tactics are now coming to a head in Venezuela. Couple this foreign intervention with America’s war on drugs, and we have the perfect storm for a refugee crisis. Contrary to what your TV is telling you, no one walks 3,000 miles with no military or training to “invade” another country, nor do they leave behind their homes and risk kidnapping, death, or worse to seek out some version of the American dream. They leave because they have no other choice and no wall will stop that—only a dramatic shift in US foreign policy will. So, remember this in just under two weeks when the government shuts down again or Trump declares a state of emergency and we have the imminent threat of martial law to build this wall—these people in Washington couldn’t care less about making you safer or protecting this country. Their job is to seek power, obtain that power, and expand that power by any means necessary, up to and including dramatic acts of political theater to keep us all fighting over which team is better.